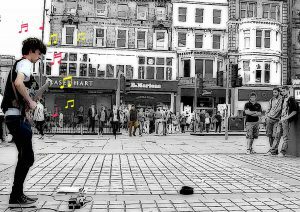 In this experiment, I focus on an occasion of interaction between a musical busker and a donator. In the video recordings, the interactions between the busker and donators were brief, lasting only a few seconds. Donators mostly deposited money into the performer’s hat during the performance. That is, they did not wait until the end of a song or the end of the performance to give a donation. Thus, the busker was nearly always busied performing when donations were deposited. Typically, a donator would approach the busker and the hat (placed on the ground just in front of the busker), deposit the money into the hat, and then depart. Either just before or just after the money was deposited into the hat, the busker and donator would mutually establish eye contact and the busker would offer his thanks for the donation. Quite often the donator would then acknowledge the busker’s appreciation with a nod of the head or a ‘thumbs up’. With these materials, I was interested in exploring how I could use the comic form to depict the way that the busker and donator mutually establish eye contact — how this incrementally and collaboratively happens. One thing that is perhaps not immediately clear in the video is that, until mutual eye contact, the busker and the donator are orienting to differing things in the setting. The comic strip below attempts to illustrate these different orientations and how they eventually come together. You will see that that panels do not all run in the conventional left-to-right format. Rather, I have arranged the panels so that the two different orientations start in diagonally opposing corners. The panels that depict the busker’s orientation begin at the top left. The panels that depict the donator’s orientation begin at the bottom right. To assist in seeing ‘at a glance’ that the panels are arranged as two groups, I have placed the busker panels on a white background and the donator panels on a black background. In relation to the busker panels, you will see that the second and third panels and the fourth and fifth panels depict the performer attending to the donation in the donator’s hand — the busker is tracking the money as it is deposited into the hat. In relation to the donator panels, you will see that the second and third panels (from bottom right) and fourth and fifth panels (from bottom right) depict the donator attending to the hat — the donator is busied with the task of giving a donation. 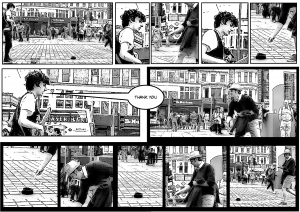 The busker and donator then finally attend to one another, establishing mutual eye contact, in the sixth panel of each sequence (starting from the top left panel or bottom right panel). At this point the busker thanks the donator (‘thank you’) and the donator gives a ‘thumbs up’. On reflection, the way that the panels are arranged does present the reader with an initial problem of how they should be read; the panel arrangement breaks the left-to-right convention. However, I think this can be overcome without too much difficulty: the panels set against either a black or white background help to show the panels as belonging to one of two groups. Furthermore, in the two opposing corner panels, the reader is also shown how the busker and the donator are positioned vis-à-vis the hat. 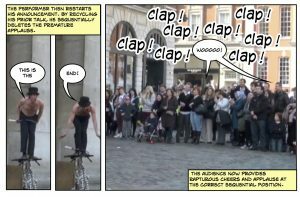 Last, the speech bubble connects the two central panels, at the point at which the busker and the donator achieve mutual orientation.